Before I share this recipe, here are all of my dove recipes for you to try! How to Clean a Dove on Video! I’m writing to you from an airplane, 30,000 feet in the sky. Isn’t technology amazing? I’m on my way to Portland, Oregon for a weekend of foraging in the woods, good eating, and general merriment. I’ll be sure to tell you what I uncover. Sweet, salty, bacony, dovey… need I say more? 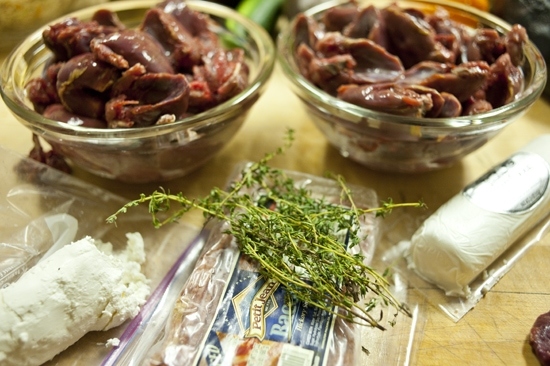 Gather up some dove breasts, soft cheese, thyme, bacon and dates. If you don’t have doves handy, you could make a version of this using chicken breasts, duck breasts or any other kind of meat your heart desires. You’ll just need to up the stuffing quantities. 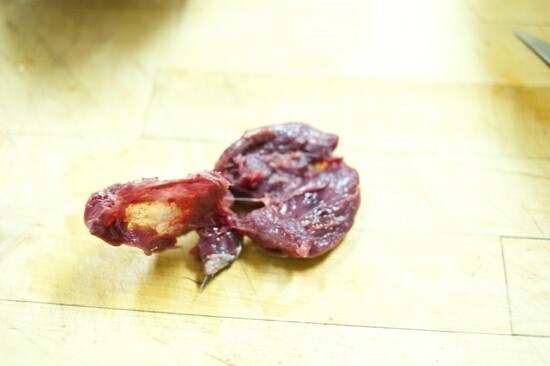 This is what a skinned dove breast looks like. Isn’t it elegant? It’s dark meat, kind of like duck, but richer in my opinion. Once you start cutting it, you’ll be able to peel it off with your fingers quite easily. This is what it will look like in one piece, ready for the stuffing. Cut a date in half. Now you could use another dried fruit here too… I love prunes and apricots myself, but I was in rural Arkansas and a girl’s gotta use what she can get her hands on. 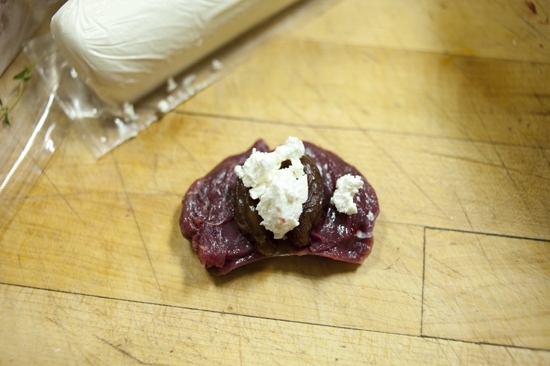 Then add a dollop of goat cheese or another soft cheese. I’m partial to gorgonzola and blue cheese as well. Then add a sprig of thyme or your other favorite herb. 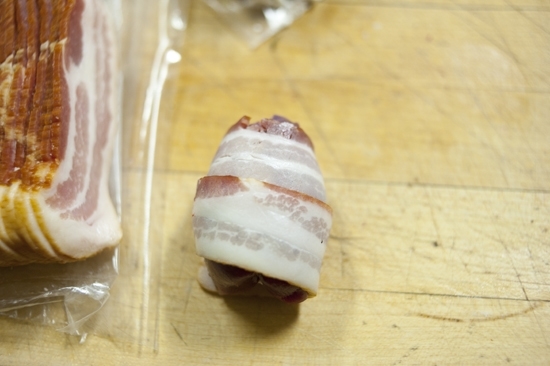 Lay out a strip of bacon, squeeze the breast meat together and lay it on the end of the bacon. It’s really quite fun. You roll on a bit of a diagonal until the breasts are covered in a nice bacon cocoon. Do this as many times as you’d like. I did it 24 times because there were many mouths to feed. Place them with the bacon seam side down so that the little packages seal while cooking. 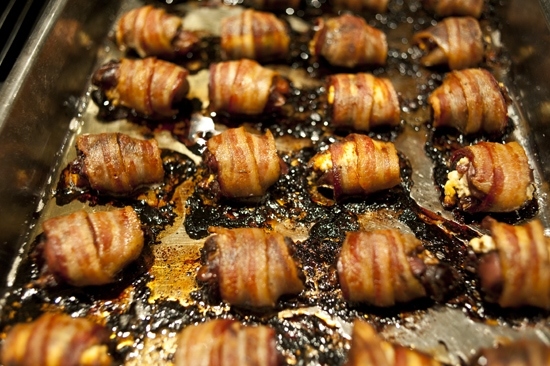 Bake them for 35-45 minutes at 400 degrees F, or until the bacon crisps up and renders its fat. You’ll love these. It has that sweet, salty, fatty goodness in bite sized packages. And like I said, you can try this with many other birds. 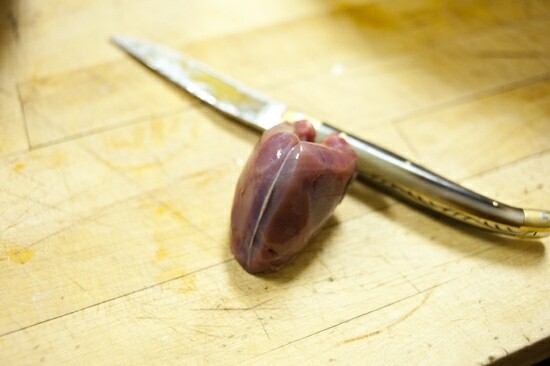 Preheat the oven to 400 degrees F. Lay the deboned dove breast skin side down and place two date halves in the center. Lay a teaspoon of goat cheese on top, then a sprig of thyme. 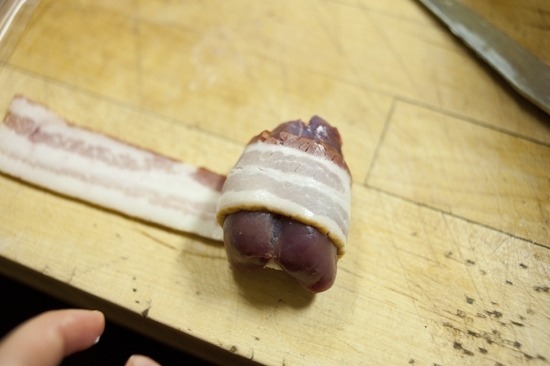 Lay a strip of bacon down, gather the dove breast together and place at one end of the bacon. 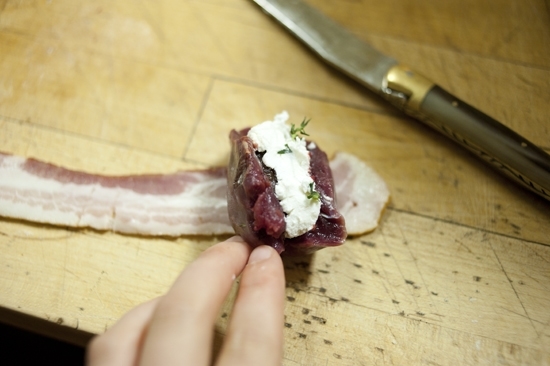 Roll the bacon around the dove breast until it is fully covered. Set on a sheet tray with the bacon seam side down. Repeat until you have all of the doves stuffed and wrapped and lined up on a sheet tray. Place in the oven and cook for 35-45 minutes or until the bacon is crispy and rendered. Serve immediately! love your description of sweet salty and fatty….makes me want to grab a few and try them out! oooh do those look tasty! Oooh, so decadent and elegant. I’m sure they were a smashing success! I am going to start talking those boys into dove hunting soon so we can have a batch of these, looks fantastic! Those look so freaking good. I wonder how hard it is to find Dove breasts in the city? If you see squab that is very similar. 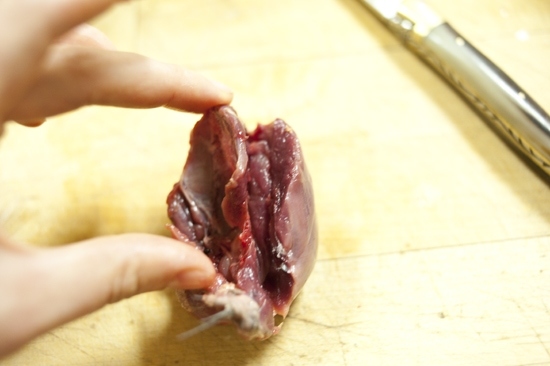 But like I said, you could do this with any bird, just up the stuffing quantities for bigger breasts! You are so resourceful!! Looks amazing and yummy like always!! Oh my goodness… this has my family’s name written ALL over it!!! They are going to love this… and I am going to be such a hero for making it!! I have never had dove, but I’m tempted to make this with chicken immediately. Sounds delicious. Reminds me of something I had years ago at a cookout. 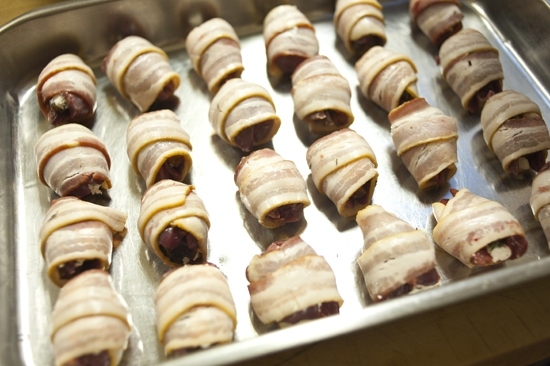 Strips of fresh deer tenderloin wrapped around seeded jalapenos then wrapped in bacon and grilled. So simple and very tasty. I think I love this. I think. 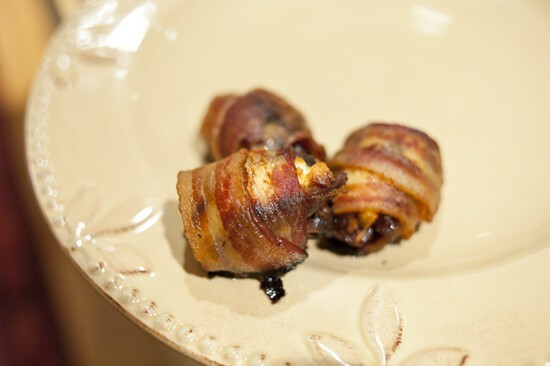 Next time cook them on your BGE with some pecan or cherry wood…OMG deeelicious. Oh my goodness! The flavor combination is amazing! 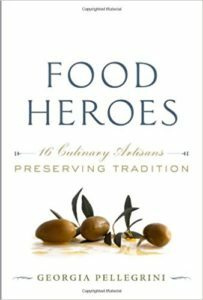 I’ve never had duck breasts and I have no idea how to find any, but when I do I’ll be making this recipe. 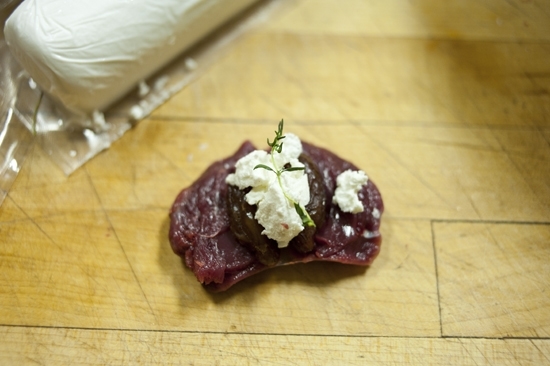 Dates, goat cheese, thyme, bacon, and dove. Yum. . . Totally intrigued… I may try it with pheasant! Thanks for the inspiration! MMMMmmmm… I am mostly a grouse and woodcock hunter but girl those look damn good. I might just have to head out for dove. I know a couple farms here in PA where they fly through on their journey south. They are fast and plentiful. I’ll have to retrain my reflexes for those close up intimate shots later in the season at the king of game birds and his little pointy nose friend. I am hoping you put out some good recipes for my two favorite quarry as the season progresses. 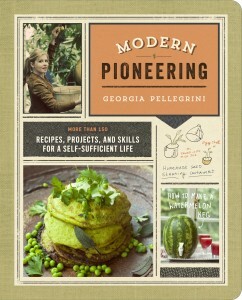 I can’t wait to get my hands on the cook book that I am sure is in the works. Georgia, I SO want to try this, but am not sure where to get doves. There are a couple morning doves that roost out on my garage roof, but they are more friend than food. Do I have to be a hunter to make this, or are there places to buy dove? 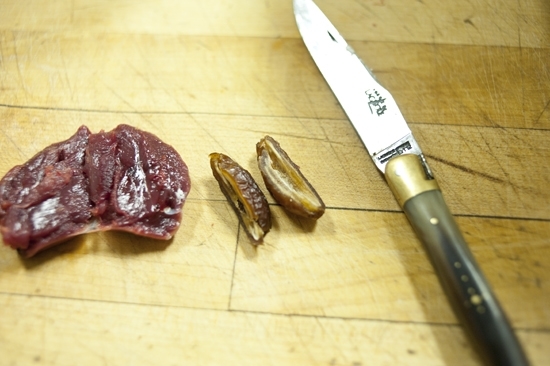 Hi Sommer, you can buy squab at many specialty stores or online which will be very similar. You could also try this with chicken and duck breast and just increase the quantities for the stuffing! But there are many online purveyors that sell interesting proteins. Thanks Georgia, I’ll look for it. SO CURIOUS! This might just be the way to get rid of a few pigeons – rats with wings turned into bitsize treats?! i am kind of into this. when I come to your house, can you make me this? Georgia, can you tell me about that beautiful knife in the pictures? Is it old or can it be bought today? The dove looks so great, our cat comes soooo close, if she wins I know what I’ll be cookin, and give her some too…. 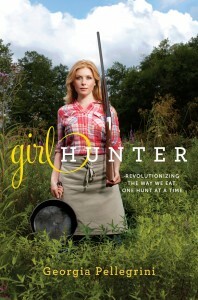 she’s a great huntress! Hi Heather! I’m so happy you noticed the knife. It’s a Laguiole which is a region in France known for making knives. My friend Paul Michael gave me one, he bought them from a dealer there. I love it, I use it for so many different things. There are ones you can buy here from an importer. My mind just exploded a little bit. Can’t wait to try this. We ate dove tonight (Labor Day) that we harvested over the weekend. I didn’t have all of the above suggested ingredients, so I improvised an amalgam of this recipe and the traditional South Texas Dove Popper. 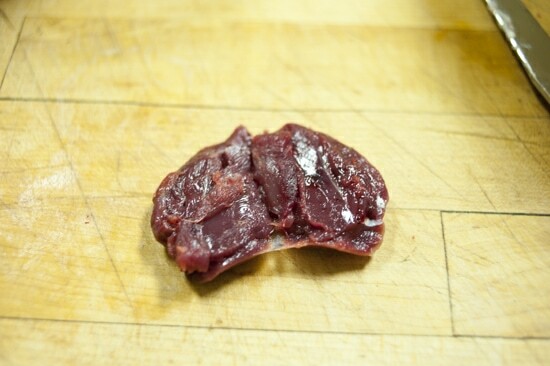 Eighteen dove breasts were marinated in bottled Italian dressing for about ten hours. In my defense, I saw this recipe after starting the marinade, but I do think it contributed to the success of the dish. Each popper consisted of a slice of fresh jalapeño, topped with cream cheese and a sliver of fresh garlic (for my herb hit), all sandwiched between two breast halves. Despite growing up ten miles from Mexico, my kids have delicate mouths, so we were careful to cut out of all the seeds and veins from the jalapeños. I wanted at least a hint of the sweetness suggested by your dish, so I wrapped with Maple Bacon and sealed with toothpicks. A little dark molasses brushed on might have increased the sweetness a little, so I may try that next time. I grilled the Poppers over medium high, and shuffled several times to balance the hotspots on our grill. 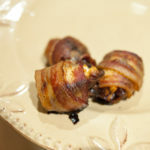 As the bacon crisped nicely, I pulled the Poppers off and served hot. We had mashed potatoes, green beans and sourdough bread to go along and enjoyed a great meal with friends and family. My daughter asked when we can have these again, and even my non-game-eating friend had seconds. He just pretended it was dark chicken. Sounds like such an inspired dish! I’m glad you’re converting friends 🙂 Go you. For this recipe do you like the whole date or will half do? 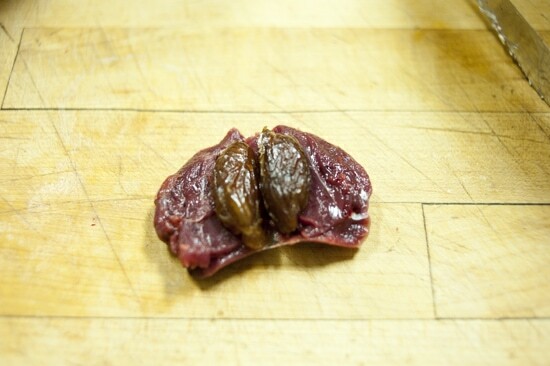 I hear dates can over power and you miss out on the dove. I used a whole date but perhaps try both and see what flavor balance you like! Thanks so much for sharing this recipe! Now I will have an excuse to drag my dad out dove hunting! Ill just tell him that if he doesn’t do the driving (haven’t got a license, too young) then he, mom, and Ly aren’t getting any bacon wrapped birdies! how long/hot hot would you cook these if prosciutto was substituted for the bacon? I’m declaring war on the bacon wrapped everything trend happening right now lol.